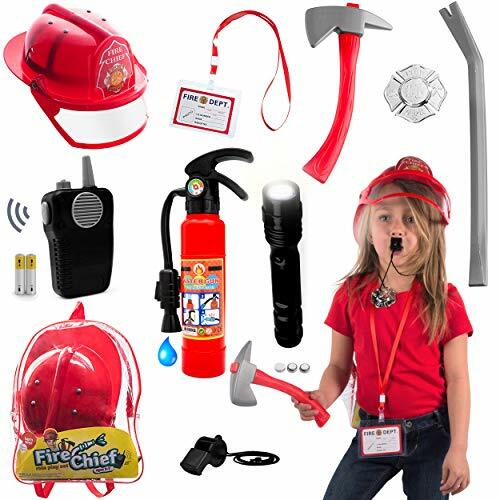 Firefighter Role Play Costume Dress-up Set Includes: Jacket, Helmet, Backpack Water Blaster, Extinguisher, Bullhorn, Pry Bar, Axe, Walkie Talkie, Flashlight, Whistle, Badge, Name Tag. Backpack Water Gun Blaster and Extinguisher Shoots Real Water. Flashlight and Bullhorn Have Real Functions. Flashlight Requires 2 AA Batteries. Bullhorn Has Built in Button Batteries. Bullhorn Makes Fire Alarm Sounds. Flashlight and Bullhorn Have Real Functions. Flashlight Requires 2 AA Batteries. Bullhorn Has Built in Button Batteries. Bullhorn Makes Fire Alarm Sounds. 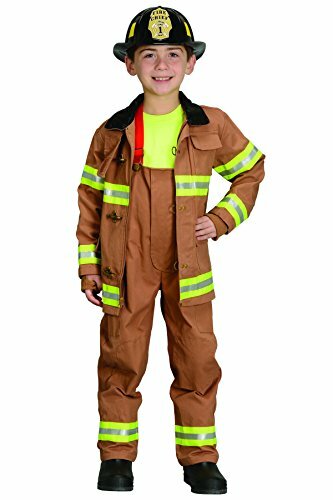 Firefighter Costume With Jacket, Pants and Hat. 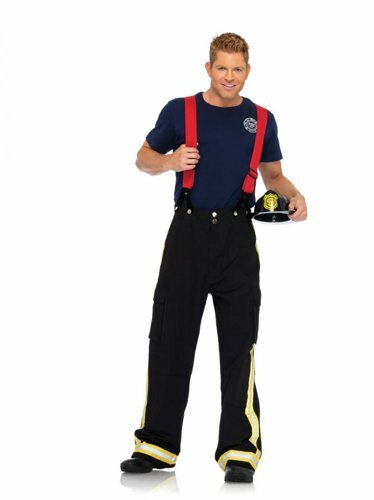 Light up Badge on chest of the costume, Batteries included. It is battery operated and glows / lights up when the button on the top of battery is turned on. Size S: Jacket length: 20", Chest : 28", Sleeve 15", Pants length: 28". Size M: Jacket length: 22", Chest : 32", Sleeve 17", Pants length: 32". 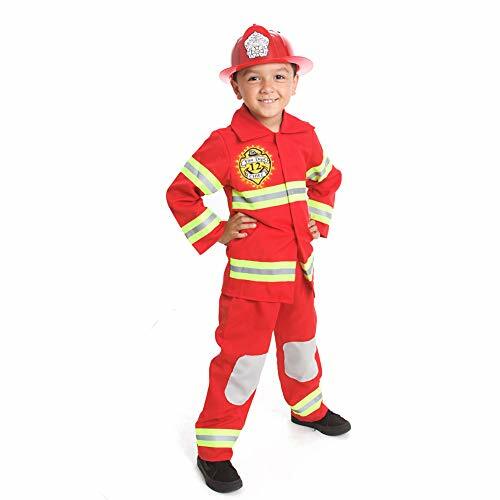 Do you kids love role play toys and firemen? Are you as a parent sick of little toy pieces all over the place? Are you tired of spending all that hard earned money on roll play sets that lack all the accessories or batteries? Are you frustrated with toys that don't work and break after a very short time? Born Toys has spent endless time creating a solution for all these problems.Born Toys has had kids experiment with their toys and have parent approval on their roll play sets that with stand the test of time! 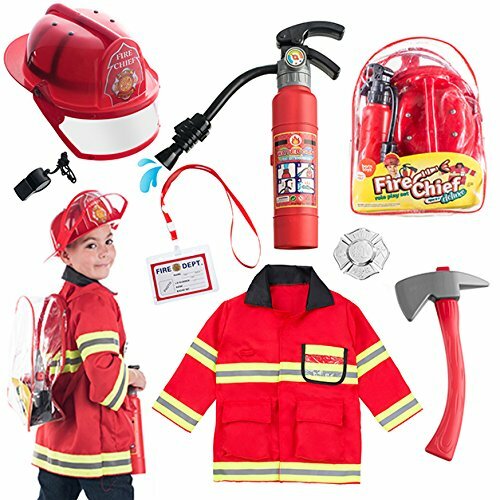 Having high quality toys and a fire bag to store them in ensures your child's toys will not get lost and allow for years of playing time to come while also encouraging good cleaning habits for your child. 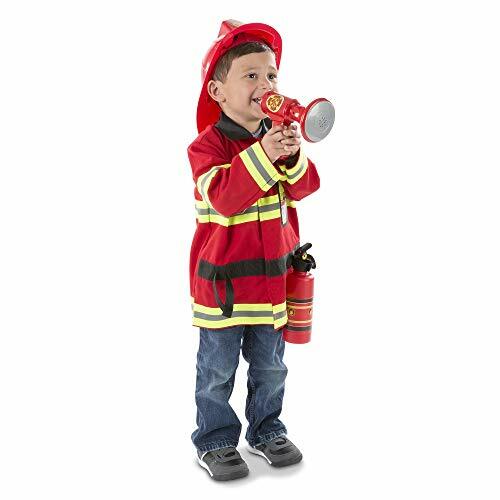 Order now during limited time pricing with confidence as Born Toys offers a 100% money back guarantee.These role play sets are going fast at this price. 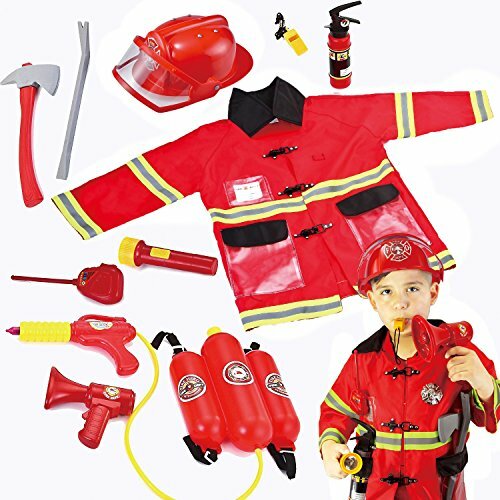 Give your child the enjoyment and yourself the relief of a long lasting and easy cleaning role play set today. 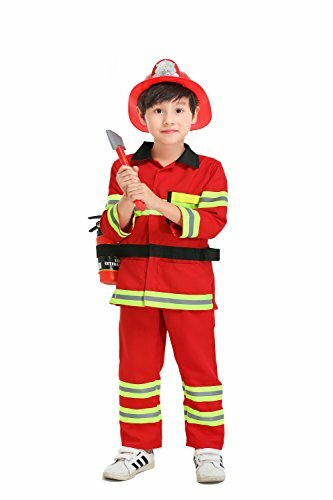 Size: Child's (2T) for ages 1-3 - 33.5" height - 20" waist - 21" hip - 13" inseam - 21" chest33.5\"
dazzling toys Fire Chief Role Play Costume Set - Includes Some Pretend Fireman Tools-fireman's Axe, Handheld Radio. Contains Plastic Holders to Hold Tools on Vest.